Hair transplant is a medical procedure which involves making incisions in the skin, both during extraction and planting. It is hence an operative procedure, and any operative procedure carries with it various risks and complications. Over the years hair transplant has emerged as the most common cosmetic procedure for males. Hence it is now seen as a lucrative business and several unscrupulous and unethical clinics have started offering this to make a quick buck. Clinics which were once homeopathic clinics have added hair transplant as a procedure, and the procedure is even done by homeopaths, although they are in no way qualified to perform this. In other cases procedures are done by technicians or MBBS doctors who are quickly trained for a month and start doing hair transplant. In other clinics again, the procedure is done by doctors who fly in from other towns and cities and make some quick money by performing the procedure and then disappearing without a trace, leaving the patient in the lurch. The clinics themselves are totally unsuitable for an operative procedure, and although they may look very attractive from the outside, good interior decoration has nothing to do with a medical procedure which demands good sterilization, adequate instrumentation and emergency backup. To prevent their shortcomings from being discovered, these clinics come up with flashy advertising including unbelievable prices and catchy slogans. In this way they hope to ensnare those looking for the cheapest rates without bothering about quality. To ensure that he gets the best deal, the prospective hair transplant patient must be careful not to be taken in by initial figures. Even when the prices offered by a clinic may seem very tempting, the patient can often still get cheated as the final result can be very disappointing. There are some important questions that the customer must ask both to ensure that he gets the best results and for his own safety. What are the qualifications that a doctor requires for hair transplant? 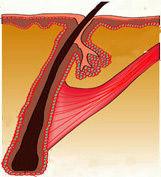 Hair transplantation is a medical procedure. Only a medical doctor is qualified to do this procedure. AHRS India – The Association of Hair Restoration Surgeons of India is the official body of doctors who are qualified to do this procedure. Only MS ENT, MS General Surgery, MD Derma and MCH Plastic Surgery degrees are qualified to do this procedure. Nowadays many procedures are performed by technicians, ayurveds, homeopaths and MBBS doctors, but this is not legally tenable. However, because of the laxity of law enforcement in India such violations of law are still being allowed. This is the most important question that the patient can ask of his doctor. The patient must ascertain whether his doctor has the qualifications mentioned above. Only a doctor having any one of the above mentioned degrees is qualified to do a hair transplant. Membership of AHRS India is an important verification of the qualification of the doctor. Only qualified doctors are allowed to be members. AHRS India also enforces many rules and regulations which its members have to follow, and so membership of this body automatically ensures that strict ethical and safety procedures will be followed. Dr. P. J. Mazumdar is a member of AHRS India. Who will do the procedure? Will the doctor do the FUE part or not? This is also an important question to ask. The doctor who gives the initial advise may not be the operating doctor. Often it is a technician or someone else who actually does the procedure. It is important to ensure that a qualified doctor does the actual process of FUE, the extraction of the hairs, and also the slit making, or the making of the holes where the grafts will be inserted. In general, implantation or planting of the hairs, which is not technically demanding, is done by assistants everywhere. Is it by a fly-by-night doctor or is the doctor resident? This is also an important question. Many clinics, specially local franchisees of business chains, get doctors who come in for a couple of days, do the procedure and then disappear. In case the patient has any problems, he is unable to get to the doctor who has done the procedure. Such fly-by-night doctors are not real experts, they are almost universally doctors who are beginners or who are not successful in their own cities and try to get patients outside. An expert doctor does not have to go looking for patients, patients will come looking for him. For a doctor who is already successful, going to another city to do a procedure is not rewarding, the hassles and expenses of travelling are too cumbersome, and he would always prefer to do it in his own city. It is only those unsuccessful doctors who do not have enough patients in their own cities who travel to other cities. What are the qualifications that the clinic requires? A clinic has to meet certain criteria to do hair transplant. Hair transplant is after all an operative procedure, however minor, and problems like infection can occur if the clinic is not qualified. Simply renting some rooms in any commercial building is not enough to start a clinic. The clinic should have proper sterilization procedures, including disinfection, proper safety procedures and a proper emergency plan in case anything goes wrong. A proper backup with emergency facilities must be present. It is impossible for most clinics to ensure this. It is necessary for the patient to ensure that the clinic is properly qualified. The patient should enquire whether proper sterilization procedures are followed. Also he should make sure that the clinic has emergency backup. He should also ensure whether the clinic is primarily a homeopathic/ayurvedic clinic or an allopathic (scientific medical system) clinic. Hair transplant is a modern medical treatment and homeopathic or ayurvedic or non-medical centers do not have any authority to perform this. Wherever such centers are doing these treatments, it is being done illegally taking advantage of the laxity of law enforcement in India. Arogyam Hair Transplant Clinic is a part of Downtown hospitals, the largest private hospital in the North East and one of the oldest, with a long and well established reputation for excellence in medical care. It is an ISO registered hospital, and strict regulations are a must for all procedures. This is something which is difficult to ensure as every clinic will of course say they are doing this whether its true or not. But this is vital to get best results. There are established norms and procedures for hair transplant, but cheaper clinics will try to use short cuts to finish the procedure as fast as possible. They will also typically use second rate instruments which are far cheaper than the best quality. 6X Heine Loupe: This ensures that the procedure is done under best vision which provides precision and accuracy at all stages. 6X Loupes are difficult to get acclimatized to and is used in the North East for the first time. Blunt Titanium punches: Arogyam Clinic uses the blunt punch technique for extraction of hair. Most clinics use sharp punches. Blunt punches are difficult to master but they protect against transection and damage to the grafts. Sharp punches are fast but they cause a lot of cuts and damage. Choi implanters: These are special instruments which are used during implantation and which ensures much less handling of the grafts thus enabling superior results. Most clinics use manual implantation. Sterilization, Autoclaving and Fumigation: Arogyam clinic is housed in the main OT complex and this makes sure that the best sterilization and fumigation techniques are used to provide total safety for the procedure. How long has the clinic been doing this procedure? It is also important to ensure that the clinic has sufficient experience. Many new clinics are coming up throughout India hoping to make some quick money and they often offer very cheap rates only to get some experience and practice in the procedure. There are also many clinics which are franchisees of bigger business chains, and even though the business chains may have some experience, the franchisee itself is often totally inexperienced. 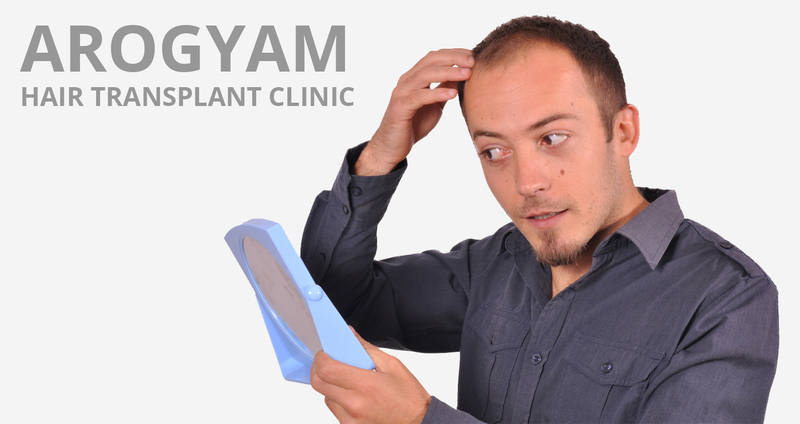 Arogyam Hair Transplant has been doing FUE Hair transplant with motorized punches since 2012, and it is to be noted that this procedure was established internationally only in 2006, and in India from around 2009. How reliable are the hair transplant business chains and their franchisees? In the last couple of years, a new phenomenon that has developed in India is Hair Transplant Business chains. These chains have opened up new franchises in the smaller towns and cities of the country. The biggest drawback of such chains and their franchisees is the quality of treatment. The business centers send out their operators to do the procedure in smaller towns, but these operators are invariably poorly paid and rarely last beyond a couple of years. Hence they are almost all as a rule young boys looking to gain some experience and practice. In most cases they are homeopathic or ayurvedic doctors, or simply OT technicians. Rarely they may be MBBS passouts. But it must be noted that only MS ENT, MD Derma, MS General Surgery and MCH Plastic Surgery are qualified for hair transplant. Such qualifications will never be found among big chains. The interiors and lighting of such chains is also geared to make it look attractive to prospective customers, and in doing so they hardly care for whether proper sterilization can be achieved. It must be noted that a good operation theater cannot be made to look decorative as the theater as a rule must be as bare as possible as decorations can attract dirt. These considerations are not given importance in the clinics as their main aim is to attract customers. The big advantage of such chains is that they can do a lot of advertising since their budget is on a large scale. They come up with catchy slogans describing different methods though these are soon discarded and new ones come up very soon. They can also advertise on a big scale in newspapers and radio and offer mind boggling discounts to trap the unsuspecting customer. They are able to provide such discounts because their 'surgeons' are poorly paid, and they also compromise on quality and count of hair grafts. They will usually do far less than the promised number of grafts, and also plant damaged and cut grafts. Another trick is to calculate the pricing on the number of hairs rather than grafts. The main aim of these clinics is to grab as many customers as they can through advertising. They are not overtly concerned about results and do not get repeat customers. But because of their huge advertising and cheap rates, they are able to make a profit. In conclusion, choosing a hair transplant clinic has become a risky business. The prospective customer must be careful and rely on logic and common sense before going for the procedure. He must not rely on advertisements and cheap prices. In fact big discounts are often a sign that the clinic is doing some big shortcuts somewhere. Medical procedures are not suitable for discount pricing as quality must be ensured. Those looking for cheap prices without bothering about quality are bound to be disappointed with the results. Qualifications of the doctor and the clinic must be ensured in order that the patient gets a satisfactory result which makes him happy. Hair transplant results after all are going to be always visible on the patient, and a bad transplant can end up disfiguring the patient for life.